There’s now just 101 days until Britain is set to exit the European Union. THE BRITISH CABINET is set to discuss whether the government should escalate its preparations for a no-deal Brexit when it meets this morning, the BBC is reporting. Communities Secretary James Brokenshire said that preparing for a no-deal Brexit was the right course of action for the government despite the fact that they want to avoid it. “I think it is right and proper that we maintain our work on preparing for a no-deal, however reluctantly,” he told BBC radio. The news comes after opposition leader Jeremy Corbyn yesterday tabled a non-binding no-confidence vote in Prime Minister Theresa May after she told MPs they will only get a delayed vote on her Brexit deal in the new year. 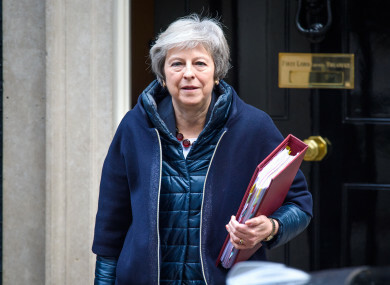 May said a vote on the deal – which was postponed on December 11 to avoid defeat – would be held in the week beginning 14 January. A letter signed by 53 business leaders has been published in the Daily Telegraph today calling on May to “take her deal to the British people”. “The prime minister abandoned the most important vote in the House of Commons for a generation because she knew she could not secure a parliamentary majority for her deal,” the letter reads. A vote of no-confidence from a majority in the House of Commons could leave her authority further weakened – and potentially prompt another vote in her entire government and a general election. The UK is set to leave the European Union on March 29 next year, but the prime minister is struggling to persuade parliament to accept the divorce deal she struck last month with the bloc after 18 months of tortuous talks. If parliament fails to approve the text, Britain could crash out of the EU with no deal – a prospect that experts warn could lead to serious trade disruption and trigger a financial crisis. Liberal Democrat leader Vince Cable tells Sky News the government should revoke article 50 "to restore calmness and stability where there currently is anxiety and panic"
May insisted yesterday that she was continuing to seek “assurances” from the EU over elements of her plan. Email “UK cabinet to consider intensifying no-deal Brexit preparations”. Feedback on “UK cabinet to consider intensifying no-deal Brexit preparations”.